Discussion in 'Classic Menswear' started by Caligari, Dec 2, 2015. Hey guys, selling a boatload of NWT and NWB ties from Drake's. All from Mr. Porter. They include grenadines, ties made for the Kingsman line (and seen in the movie), and Emma Willis. Most 100% silk, with some wool ones in there too. All ties are $109 CAD local pickup. They are all new and come in a nice Mr. Porter box. Discount if you buy more than one. All 8cm Width unless otherwise noted. All 100% silk unless noted. All pics from Mr. Porter. Sole: Double Leather - might outlast your feet. Box (a little beat up) bags (not at all beat up) included. Price: $CDN 350 shipped in Canada. Minus $25 for local pickup downtown Toronto (early morning or midday only). Fit is very similar to a 43 F last. That's equivalent to a size 9, yeah? I wish these were in my size. I'll be shocked if these last longer than a week. UK9 - yes. The extra volume of P2 versus F, plus the slight extra give that all Goyser stitch Vass seem to have make these fit more like 43 in F. I've tried 43 in P2 before and found it too roomy. Lol a small lineup has formed, but the fat lady has not yet belted out her tune. ..... And now sold pending funds to buyer 1 - thanks a bunch to everyone who inquired. They sold off their remaining stock over a year ago as they were moving to a new manufacturing facility (or something like that), but their website's gone and their Instagram is not updated anymore. I bought the shoes back then, had to pay shipping and duties here, and recently dug them out and realized they're too small for me. They come with lasted double-barrel cedar shoe trees(! ), shoe bags, but no box. Asking for $150 CAD, which is a lot less than it cost me, and a pretty great deal for such well-made shoes. Anybody a 44L and want an Isaia coat for cheap? Somebody grab this killer value in a mint Swiss automatic dive watch. This is the Glycine Combat Sub in the striking combination of red bezel and rose gold colored hands and dial markings. Water resistance: 200m (or about 150m more than most people will ever need). Watch comes with original black fabric strap and an even nicer silicon aftermarket strap with red stitching that compliments the case perfectly. Condition is mint, timekeeping is excellent. Worn maybe 4 or 5 times in the few months I've had it and got it wet all of once. It's not getting worn since I bought my MarineMaster, so off it goes to a good home. I've owned a Tudor Black Bay Red and I am here to tell you that this watch is waaaaay closer to that in quality and oberall niceness than it is in price. Grab this for about what a replacement strap for the Black Bay would cost you. CDN$325 shipped in Canada (split PP fees) or $300 cash local pickup in downtown Toronto daytime or evening / weekend in Oakville. Happy to answer questions, but the first "I'll take it!" will result in a successful kop. And this is a stock photo showing the watch mounted on the OE fabric strap. Aaaand watch is now sold - thanks peeps. Would anyone be interested in Belvest jacket/ suits in 36? And a pair of Norwegian welted Chukka Suede Boots in UK7. MADE IN CHINA, 250 CAD. Also, lowing the price of the John Lobb and Alden loafers. This is from the John Lobb classic line and it comes with shoe trees, it fits small. Colour looks closer to black in my photos due to the camera and lighting, but actual colour is as shown in the stock photo above. 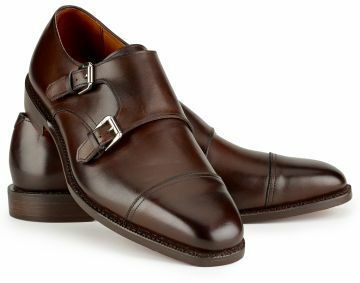 Hey guys, I'm selling a new pair of Allen Edmonds for Ralph Lauren 'Perdiswell' brown double monks. They retail for $550US. They are size 8.5D. I'm selling for $299 CAD local pickup (that's $229 US). One of the better AE exclusive models for RL and a genuine staple. It's on the chiseled '1943' Last. This is my first listing of some fall clothing I'd like to find a new home. Mostly overshirts, coats vibergs and aldens. Everything is in great or even better condition and I have more pictures I can send for those interested in any of the items I'm selling. For you're convenience i've put together a spreadsheet of the original prices (minus import fees) and a contact list of all the stuff I have available.